The news anchors are reporting that Egypt's Cabinet has just submitted its resignation, and a new Prime Minister has been appointed. As Egypt's Minister of Communications and Information Technology since 2004, you are now most likely heading back to private life. 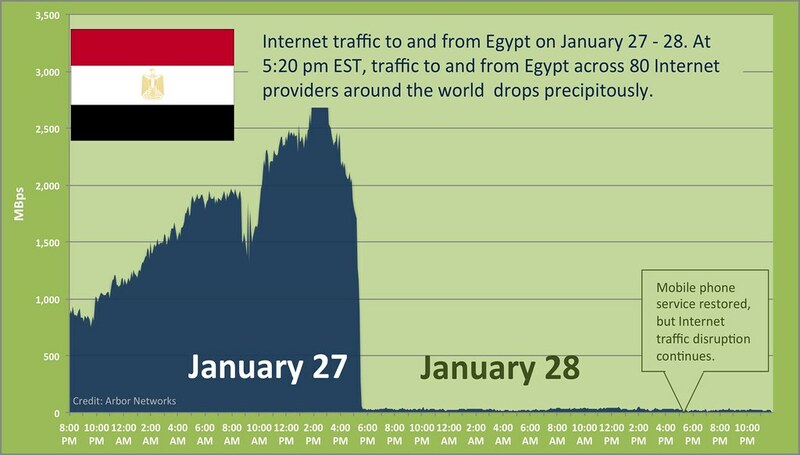 As a friend, I write to urge you to take one final action before you walk out the door of your Ministry: Give the order to reconnect Egypt to the global Internet, and to drop all remaining blocks on wireless networks. Unless you act now, in your final hours as Minister, to reverse the Internet cutoff, your name will forever be associated with an unprecedented human rights violation on a national scale, and an economic catastrophe triggered by a shortsighted regime's drive for self-preservation. That would be a tragedy for many reasons, but most of all because I am certain that you don't, in your heart, believe this decision to be right. We have known each other since we jointly organized one of the first ICANN conferences on global Internet coordination, in Cairo in March, 2000. I know you to be a man of intelligence, integrity, and character. Your record is one of ambitious endeavors, large-scale accomplishments, and thoughtful innovation. Through your early work to bring network links to Egypt and your later service as a Trustee of the Internet Society, you demonstrated your understanding of, and commitment to, the Internet as a powerful tool for free expression and human development. And indeed, until last week, Egypt's Internet, under your administrative guidance, was notable in the Arab world for being free and open -- almost entirely uncensored. (Outside your domain of control, Egypt's security forces used other, brutally effective means of controlling dissent, like relentless surveillance and arbitrary arrests and detentions.) You helped design and build a truly impressive communications infrastructure, achieving impressive levels of Internet access and use, highly competitive mobile and ISP markets, and low consumer broadband prices. Unlike most of your regional neighbors, you allowed Internet voice services without restriction. Egypt is now one of the major crossing points for the underwater fiber optic cables that interconnect the regions of the planet. You led an aggressive initiative to get personal computers and Internet connections into every home in Egypt. At an early date, you used farsighted regulatory moves to enable free dial-up Internet services. Under your leadership, Egypt was among the first countries to launch an Arabic-language Internet top-level domain, making Internet addresses vastly easier for the majority of Egyptians to use. All of these achievements, however, are now eclipsed by your participation in the Egyptian government's unprecedented decision to sever Egypt from the global Internet, and to shut down mobile phone services. Even now, two days later, as cellular networks are starting to function again, nearly all Egyptians remain cut off from the Internet. A worried mother who has not heard from her son or daughter cannot send an email or check Facebook for a status update. A witness to violence or abuse cannot seek help, document responsibility, or warn others via Twitter or blog. Life-saving information is inaccessible. Healthy, civil debate about the future of Egypt is squelched. And in the absence of trustworthy news, first-hand reports, and real-time pictures, rumor and fear flourish. In those ways, the total Internet cut-off undermines the government's own interest in restoring calm and order. Moreover, innovative Egyptians are finding ways to overcome the block. They are relaying information by voice, exploiting gaps in your digital Iron Curtain, and dusting off old modems to tap foreign dial-up services. To seek to lock Egyptians behind an airtight seal is triply wrongheaded: it harms Egyptians, increases tensions, and, ultimately, can't be sustained. It is not too late for you to act. Even as your formal mandate is ending, your moral authority is still weighty with the Ministry team you built. A directive from you to restore the Egyptian people's communications at this critical junction in Egypt's history would not only encourage peace and help restore order, but will prevent you from falling, tragically but indisputably, on the wrong side of history. You can, and must, move now to restore your reputation and reverse what will otherwise be a harsh and condemnatory worldwide judgment of your role in silencing Egyptians and infringing their fundamental human rights to speak, write, read, watch, and communicate. My friend, Dr. Tarek Kamel, for the sake of your legacy and the future of your country: Re-connect your people.